Baka – 200 sq. meter apartment. 3 bedrooms, 2 bathrooms, 1 guest toilet. Huge living room. Huge kitchen with appliances except for refrigerator but we can get hopefully from the landlord. Dining area. Downstairs den which can be used as a huge guest bedroom or playroom. 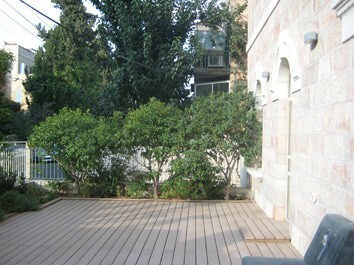 Two spacious decks on front garden. Garden in the back as well. Private parking. Private entrance. High ceilings. Apartment of charm. a/c, heating. Separate Office in the back area next to back garden with bathroom which can be used as guest room as well as for one of the older children. All ground floor. Asking 19,000 NIS, but will be negotiable.